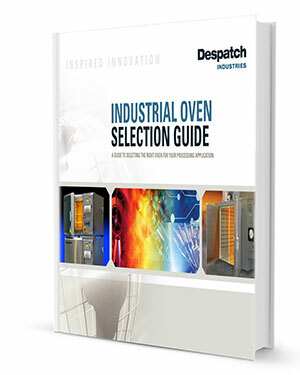 Despatch Industries has earned a reputation for high quality industrial ovens. The ovens are designed for exceptional temperature uniformity with consistent temperature profiles that can be repeated over many years. Despatch invests in superior engineering to ensure the company’s products hold up extremely well over time. Established in 1902, the company can confirm it has sold an astounding 192,000 units based on the sequential serial numbers that began in 1919. Many of these oven are still working today. In fact, a customer who bought a Despatch industrial oven way back in 1939 recently sent in a picture (which can be seen above) of said oven praising its longevity, as it is still in service after 77 years! Old equipment lasting decades in any industry is incredible, but when it comes to industrial ovens, the fact that Despatch’s products have been proven to stand the test of time over and over again is a testament to the robustness of the company’s equipment. It’s absolutely remarkable that an oven built in 1939 is still working in 2016 just as it was designed to perform nearly 80 years ago. Today, Despatch continues to evolve in order to meet the complex demands of today’s global marketplace. Their products are used in a wide range of critical applications, including healthcare, materials, electronics, transportation, and industrial markets. As was true back in the 1900’s, the company’s dedication to innovation remains unchanged as Despatch remains an industry leader and pioneer for introducing original and unprecedented thermal processing solutions to the world.